It is common for the hair fall and dandruff in the changing season. In the new age lifestyles, the problem of dandruff is seen in the heads of 80% people. Dandruff is quick because of the scarcity in winter. Use of hot water in winter: In winter, there is a lot of influence of dandruff. Due to bathing with hot water in winter dandruff occurs. Apart from this, due to putting scarves and caps in the head avoids air. Therefore, dandruff increases in winter. Use of hard shampoo: The use of hard shampoo creates dandruff. Daily use of shampoo or changing it frequently makes dry skin of the head. Therefore, people should use mild and herbal shampoo. Oily hair: Usually oil hair creates dandruff. The skin of the head becomes viscous so that dirt gets accumulated in the hair and it creates dandruff. The lack of proper diet creates dandruff. The oily food also creates dandruff. Thyroid: Those who have thyroid problem they have to face more dandruff problem. In the thyroid, the skin of the head becomes rigid and hair starts falling. The dry skin of head creates dandruff. 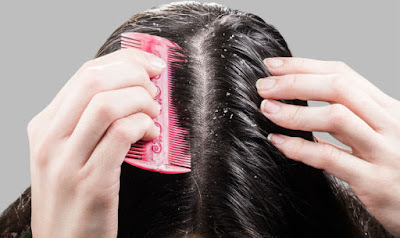 Rainy season: The risk of dandruff increases in monsoon. Because the hair keeps moisture during this period. This increases stickiness and dandruff in head. Rain water is also creating diseases.